Prominent & Leading Service Provider from New Delhi, we offer image analysis software service. 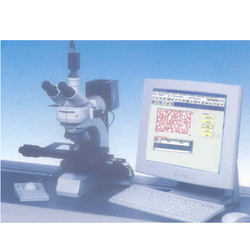 This software can be used in steel plants, Metal Forging Industry, Oil & Gas Industry, Material Science, Mineralogy - Metal and Metal Strength Analysis Cement (Klincker) quality control and where ever metallurgical microscopes are used. This Package is very useful for educational institutions and all material science technocrats and metallurgists. Inclusion DIN - Standards (50602). Looking for Metallography Software ?